This piece that I have wrote shares my own personal struggle with depression. 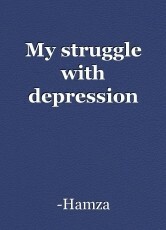 It explains my everyday life while battling depression and anxiety. Yes, I suffer from depression. I know that is such a big thing to say or throw around in a society like mine. In a society where people dont understand this mental illness that you deal with everyday of your life. Let alone the society, even your family doesn't understand it so you keep that all in your heart and mind and battle it everyday. I have been clinically diagnosed with depresssion. And I have been on anti depressants and pills for over two years now. At some point of my I planned to kill myself because I was losing all my hope and skipping my life seemed the only way I could escape the struggle of existance. But I could'nt do it. I couldn't end my life because of the fact that I couldn't leave that pain and grief to behind to my parents and to everyone that gets affected. I couldn't just pass my grief and misery onto people around me. Later I decided I needed to see a psychiatrist or a therapist that could help me in battling this mental illness that has taken over me. I saw bunch of psychiatrists both online and in person and it helped for a time being but my depression never really seemed to go away. It was always there hiding, waiting to strike. Maybe life isnt for everyone. And my struggle with it became more vicious as I was left stranded on days where I would just lock myself in room and bathrooms and cry all the time. I never showed signs to people about my depression because I knew in my heart people wouldn't understand and it will only make it worse. So I kept it in my heart and fought it alone. What people dont understand is that depression isnt always what you have when you are alone at night with you thoughts. It can strike you middle of the day even when you are with your friends, sharing a laugh and you just stop. Days went on and it got worse and worse. I kept falling into that hole and my life was a misery. I got to a point where I had so many anti depressants that I became numb. I just could'nt feel anything. I had sadness. And I didnt know where it came from. My depression never left me. It was always there and I knew it in my heart. I kept telling myself that tomorrow will be better when I knew it in my heart that tomorrow will be worse and I didnt know how long I could hold on. What people generally ask is when does depression end. Well the truth is it never ends till it ends you. Sometimes literally ending yourself and sometimes you have to die inside everyday. To live, you have to kill the person inside you every day for a long time. What people need to understand is, depression is real and It can happen to anyone. People joke about and ask you why are you depressed when you have so much. The answer is, this depression that I have is beyond my control and I didnt choose. No one chooses a misery by themselves. I have lost a big part of my life to this depression that I have. A part of my life where I could have done so much but I just ended up isolating myself from everyone around me. It is a constant darkness inside your mind and some days it takes all over you. Depression is real and it can happen to anyone regardless of the situations and places that he is in. Be kind to people around you who battle depression because you have no idea whats going on in their head. They can smile and brightest but only they know how alone they are. Stop making depression something to joke about. It is real. © Copyright 2019 Hamza S. Arisar. All rights reserved.